SUZY Q's VIEWS -- See them on the Facebook page. Just click on her image. 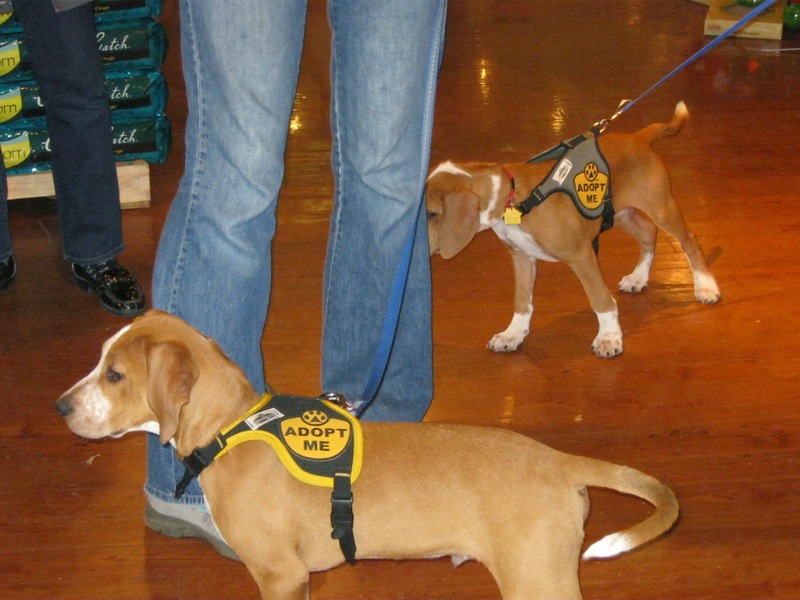 It's fun to report on the success of adoptions by Almost Home Dog Rescue. 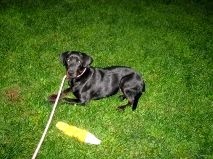 Although I've been behind on my blog, many dogs have found furever homes, and I thought I'd share a few pictures and their stories with you. 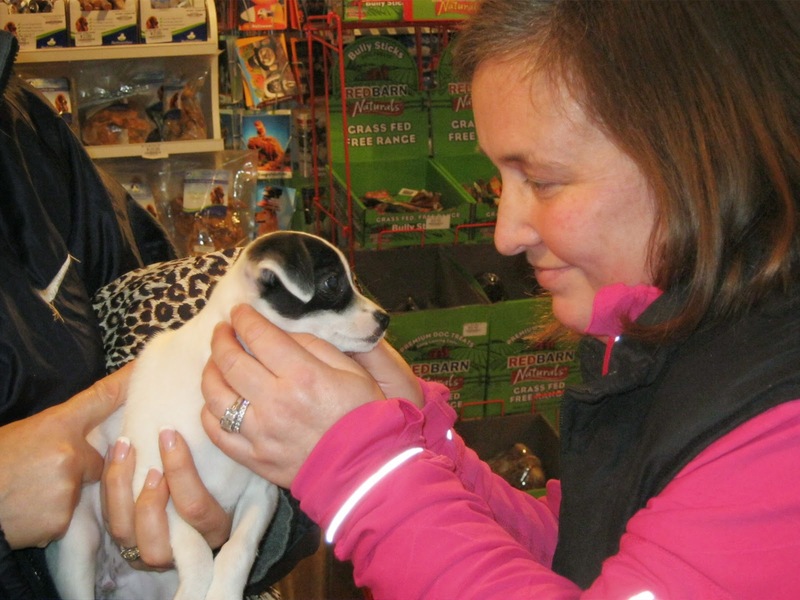 "Jackie" was adopted around the first of the year. She was named Willow by her new family, who reports she has settled in nicely. Like most puppies her age she spends the day playing, chewing or sleeping, and generally keeping her family on their toes. 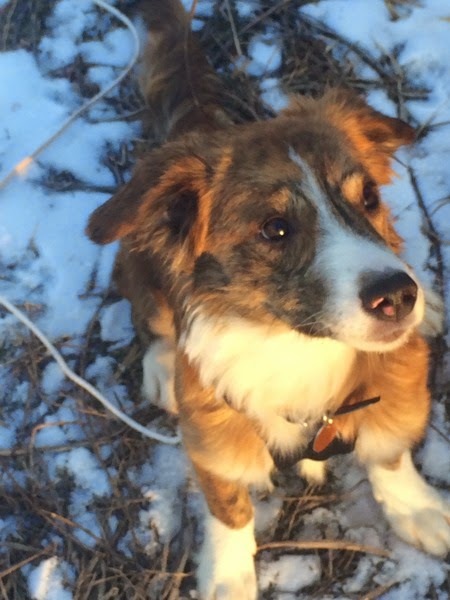 They get up a little earlier these days, but Willow is a bundle of fun, and has gotten her family into exercising more by taking them on long winter walks! They are thrilled to have her as part of the family, and her new big brother, Oakley, loves her so much, he even tolerates her biting his ears while he's trying to sleep. 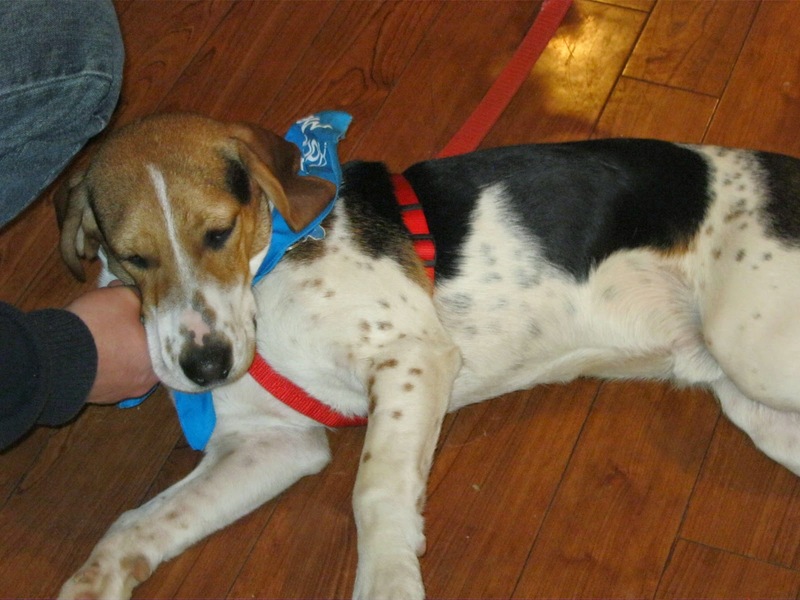 Sherlock became Tiller when he was adopted and joined his new family. He loves his walks at Lake Nockamixon on cold days, and his new Mom and Dad absolutely love him! Such a handsome boy! Can you tell Shane enjoys having his belly rubbed? He also gets excited when he goes for walks, and car rides are his new favorite thing. As soon as the car door opens, he jumps right in and settles down for the ride. He is a hit with everyone he meets and he's so brave that when his new family took him to the vet to have his nails clipped, he plopped on the technician's lap and let her trim away. He is one happy dog! 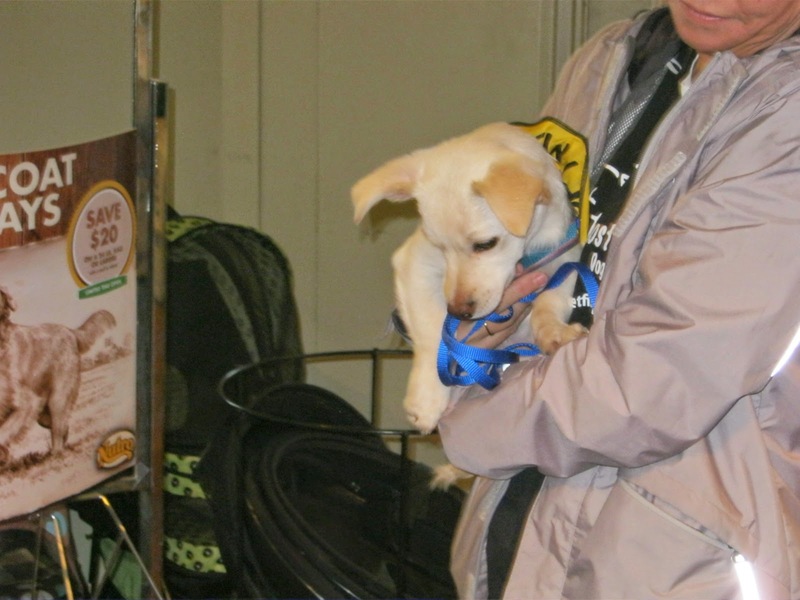 Saturday, December 6th, Almost Home Dog Rescue had a Meet and Greet which was well-attended despite the heavy rains and cold temperatures. It was chaotic, fun and successful. 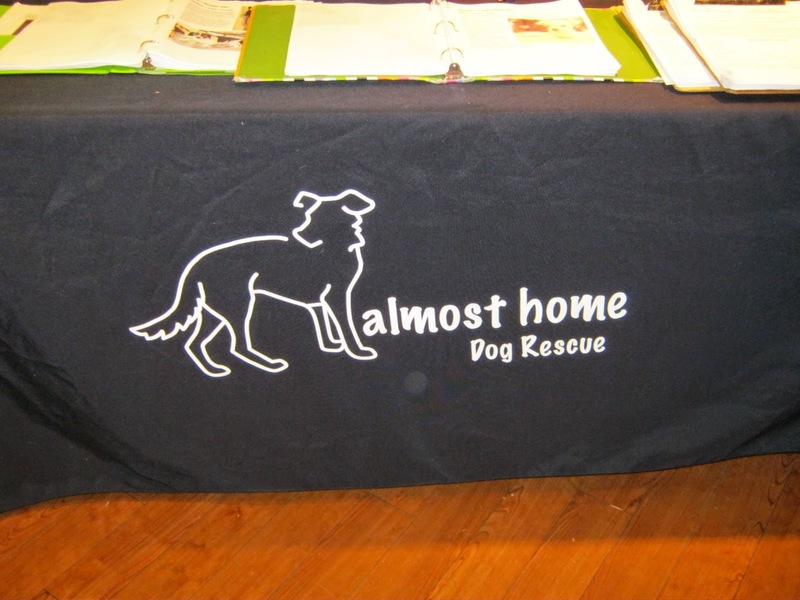 Most, if not all, of the dogs had made a long journey to become part of the Almost Home family of dogs up for adoption. Meet MaeBell. She barely squeaked by the dreaded “list” on that afternoon she left on her trek north. She found her foster home just in the nick of time. About one year old, MaeBell loves belly rubs almost as much as she loves her favorite stuffed hedgehog squeaky toy. She’s house trained and is working hard on perfecting her leash-walking skills. 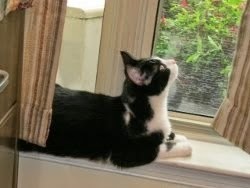 Her foster family reports that MaeBell seems fearful of strangers who come visiting, so her ideal home would most likely be a quieter one, with someone who is willing to give her the time and space she needs to feel comfortable. But she did very well at the Meet & Greet, and just look at how attentive she is. And she has a great smile! Emmet was quite popular at the Meet & Greet and had a couple of families who seemed very interested in him and spent a lot of time with him. I’m keeping my fingers crossed that he will soon be living in his new home. He’s about 7 months old and a nice medium size. He’s active, but loves to be pampered. He sure looks like one happy hound! Justin is looking for a new place to hang his teeny-weeny leash. Justin appears to be a few months old and weighs about 8 pounds. He is certainly a character. 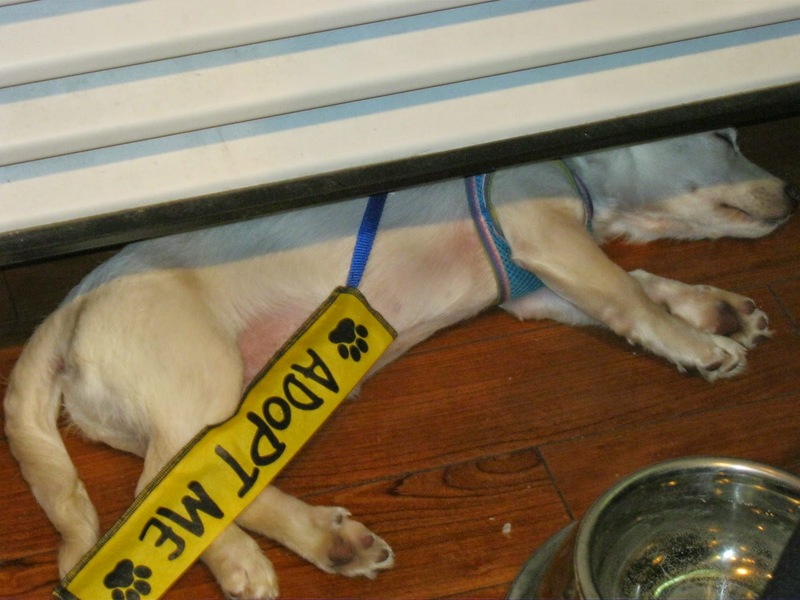 He found the activity of the Meet and Greet to be tiring towards the end, so he plunked himself down for a nap along the wall, only after exploring the possibility of dozing under the Almost Home table. Either that, or he was trying to supply real legs in lieu of the fake ones of the Almost Home logo. He’s one cute little guy and enjoys everyone. He’d be great with an older dog who can perhaps teach him the ropes on how to be a great doggie member of a loving family. Lovely Lucy is as sweet as she is pretty. 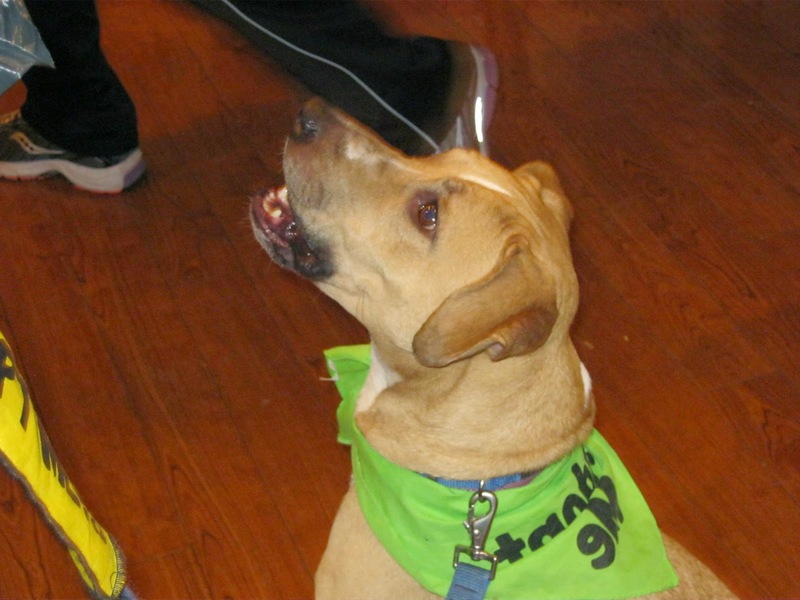 She loved all the attention that came her way and is always happy to meet new friends, big or small, human or canine. She loves playing with her toys, and walks nicely on a leash. 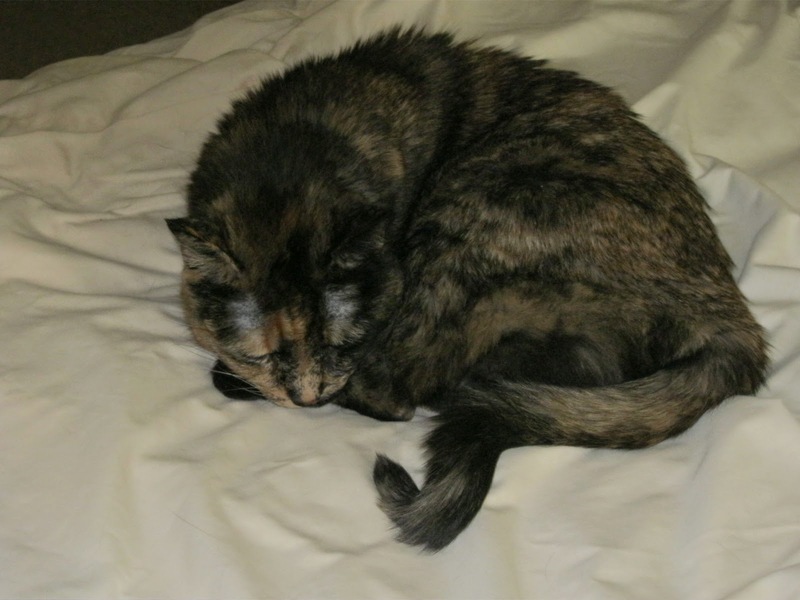 At about 6 years old, she’s a perfectly well-mannered lady and could fit right in with just about any family. She made the long trip north to Almost Home Dog Rescue, and she’s hopeful her new family will find her soon. 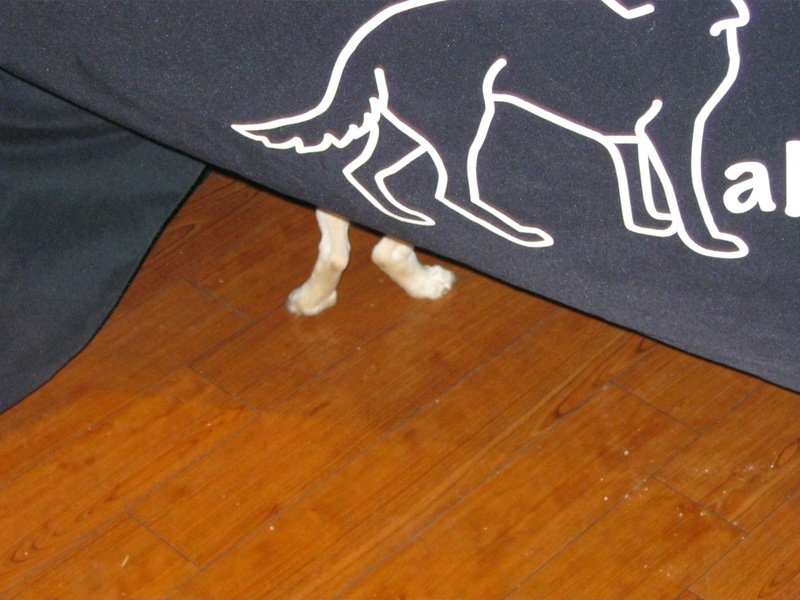 Did You Say You Have a Cat? This little miss called Missy has had quite an adventure in her short six months. It started with being dumped in a roadside ditch. 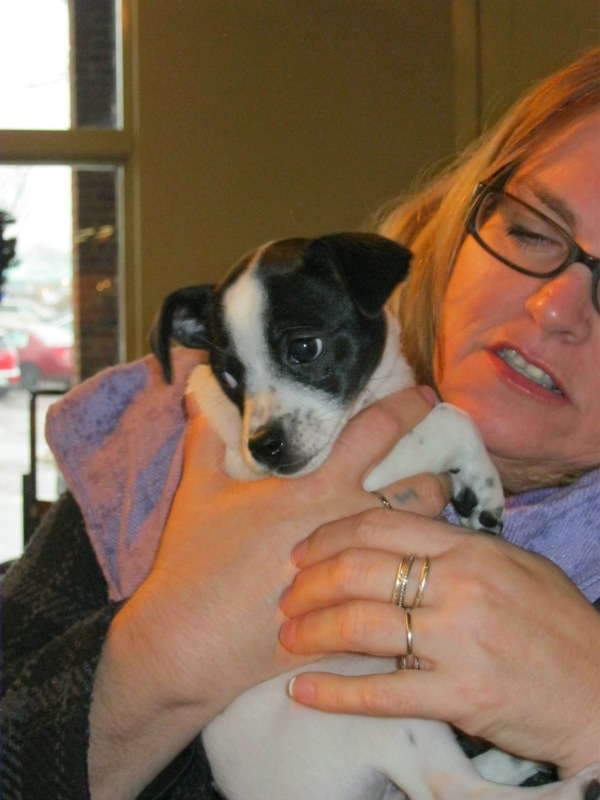 But luckily, a Good Samaritan found her and brought her to a local rescue. She has landed at an Almost Home foster home, and is doing great. Weighing in at about 26 lbs., she's a sweet, healthy and playful pup, who has a great time with other dogs, but the cats – not so much. 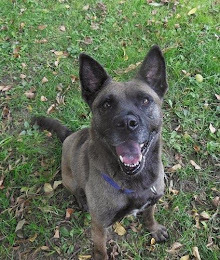 Missy loves to run around outside so would be thrilled to find a family with a fenced yard. She has lots of love to give and is quite friendly. Parker in Perfect Pose; Winston's a Mover and a Shaker! Parker and Winston, who are both about four months old, arrived together after being rescued from a deplorable shelter in North Carolina. Parker weighs about 18 pounds, and Winston about 15. 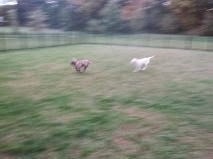 Both dogs are so cute and have oodles of personality, are friendly, and are happy they were lucky enough to now be in Pennsylvania, where they just know they’ll find families to call their own. They are fun-loving boys with plenty of energy. Skittles and Snickers have a special story to tell. Their mother, Sugar, was barely more than a pup herself when she found herself dumped at a small, rural southern shelter with her two babies. Luckily, they soon found a foster home where Sugar was able to raise her pups in safety. Everyone flourished. And soon they were on the transport list and arrived into the fold of Almost Home. And then miracle of miracles, Sugar got adopted! So Skittles and Snickers arrived at the Meet & Greet with high hopes. 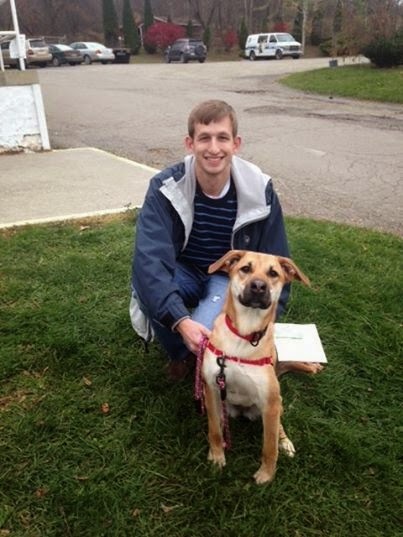 And it paid off for Skittles, who most likely has found her forever home. 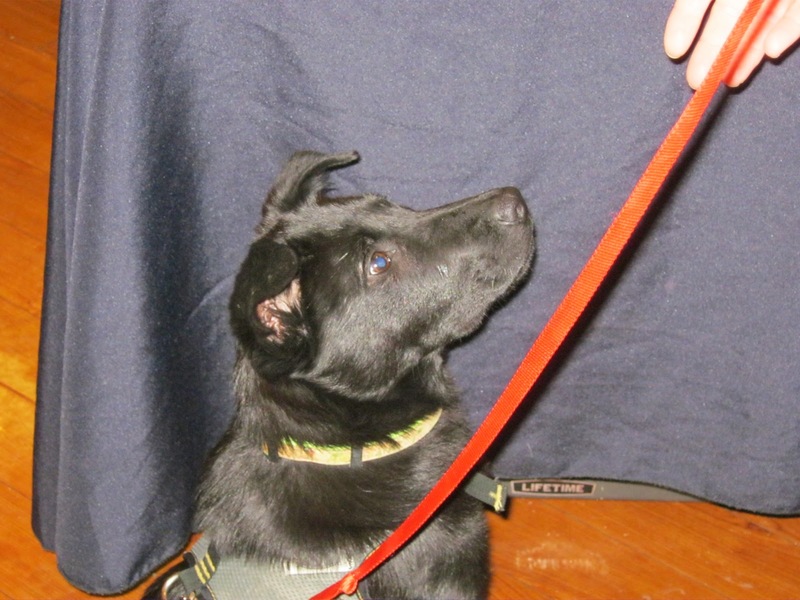 Little Snickers, who had people clamoring to pet him, is hoping he charmed someone too. Both Skittles and Snickers, if they are anything like their mother, will be little Velcro dogs who love their people, enjoy cuddling, and will also be happy and playful. If you want something sweet in your life, Snickers may be just the ticket. It certainly looks like Skittles was the perfect one for her new mama. Mandy’s story is a little different. Sadly, she lost her home for some reason and was surrendered to another southern shelter. 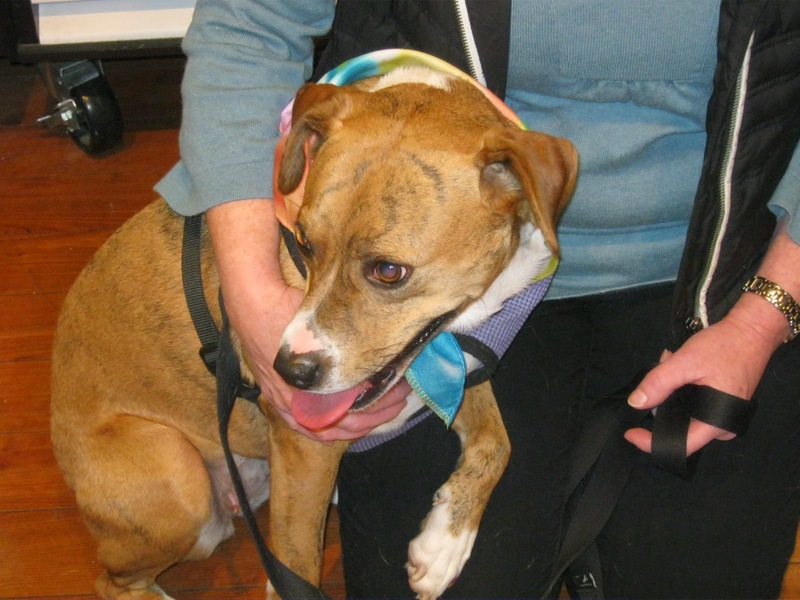 But her luck changed when she was scooped up by Almost Home, who promised to find her a new home to hang her leash. 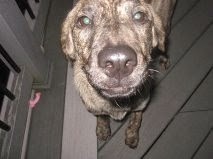 In the meantime, she’s staying with a foster mom who says Mandy is a real sweet girl who is calm and gentle. She gets along nicely with her foster dog and cat siblings, but will choose to be with her people above all others. She’s a snuggler, and knows some basic commands, and is leash-trained. She just wants to be someone’s cuddle buddy! And what a beautiful face she has! Check back in the next week or so. I hope to have updates on a few of these dogs, as I think at least two of them may have also found homes. Hopefully all these dogs will be in their furever homes by Christmas! Thinking about Halloween. What shall I dress up as? 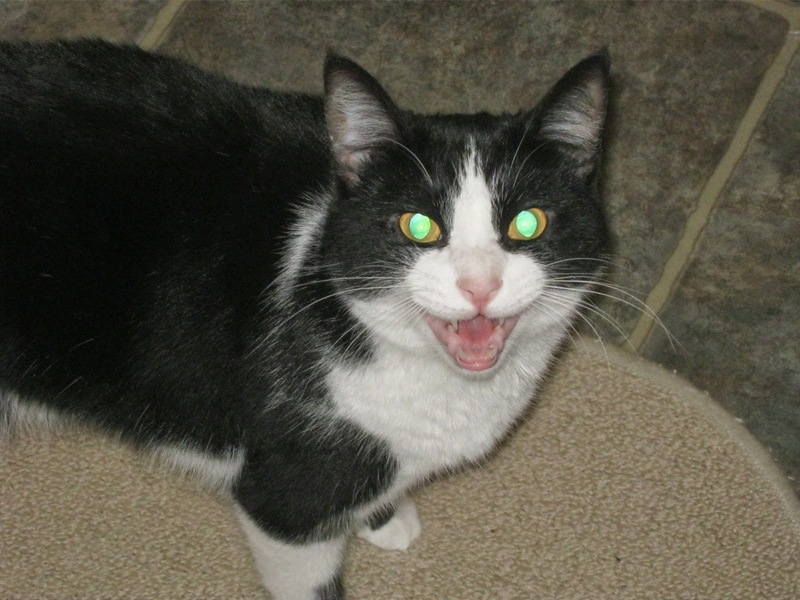 Oh yeah, I’m a black cat. Maybe that’ll do. 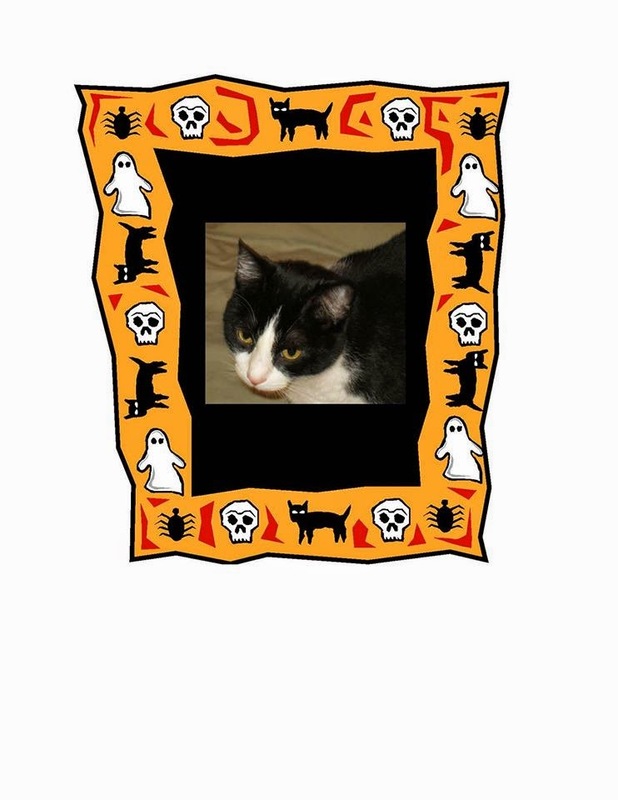 Halloween – a perfect holiday to spook my cat siblings. I’ll start plotting now. Today's Halloween! I can't wait for tonight. I don't want to spoil the surprise, but this cartoon picture is a hint of things to come. And here are pictures from last year's Halloween. Boo! Heh, heh, heh. I thought I’d tricked ‘em good! This is me. Scary, huh? And this is them. You win some, you lose some. But I had a great Halloween anyway! Mandi: Am I supposed to be scared? Home, Sweet Home for Gloria! Gloria found her forever home after only a few weeks at Animal Care Sanctuary, where she had a romping good time. But there's nothing better than having her own home with her own family. I couldn't be happier for her! Sure looks like she is going to be loved and make the perfect addition to her new family. I swear she's proud of herself as she poses and grins with glee! As always, Bridgette was open-hearted to taking in a few dogs who were being transported the weekend of 10/18/14. She certainly has the perfect property for dogs to let loose on, and indeed they did. Heck, I think I want to live at Bridgette's! 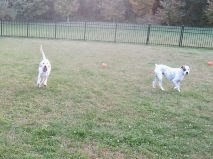 Anyway, these great dogs had a blast as they relaxed and played overnight, on their way to the northeast the following day. What a great mini vacation they had. 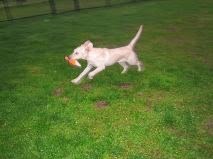 Rosa, running freely with a toy. Rosa and Stella roaming the range. Rosa showing the ropes to a new friend. An article appeared in The Chestnut Hill Local about the Almost Home Dog Rescue fundraiser, a 5k walk/race held September 27, 2014. It is a great article and speaks well about how Almost Home operates. Please click on this link to read about it. 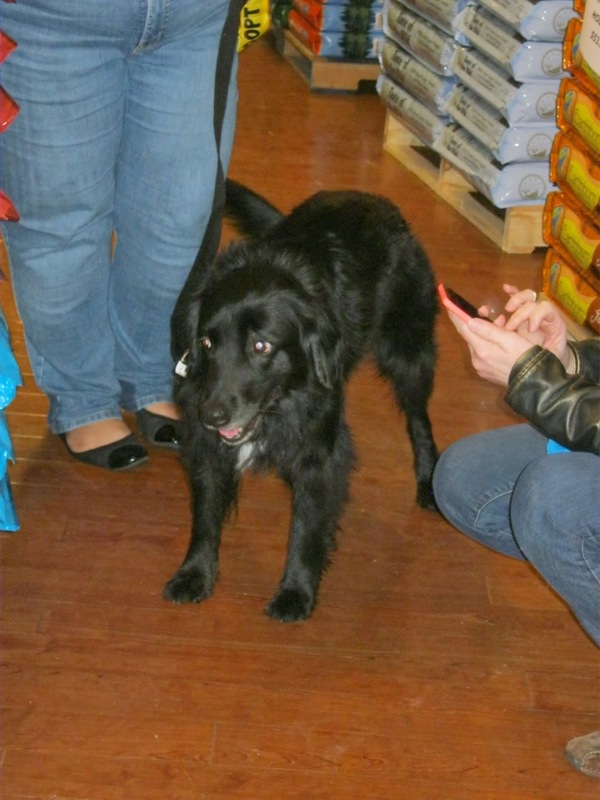 Layla Finds Her Family! Lovely Layla went home Thursday with her new family, a woman and her adult son. Layla will be their one and only. They had seen Layla and that was it, but the mom decided to surprise her son by not telling him they were adding Layla to their family. In an unusual one-day adoption, Layla was on her way home, with a stopover on the way to buy tennis balls, because they knew Layla's favorite activity is to chase after them. Happy days are ahead for Layla! We'll miss you, sweet girl. SuzyQ: Hey, I'm Resting Here! Transport Drivers Save the Lives of Dogs! Please consider being a transport driver for an organization in your area. 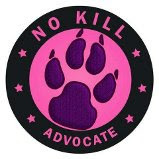 Help get dogs out of situations where they will be killed and transport them to a safe place, either a dog rescue group, a no-kill shelter, a foster family or best yet, their forever home. It's very simple. You sign up, they send you an e-mail telling you when the next transport will occur, and you have the opportunity to sign up for one of the "legs" of the long journey. If you sign up, you show up at the location at the appointed time and transfer dogs from another driver's vehicle into yours. You then drive the dogs to the next location, which is usually about an hour away. 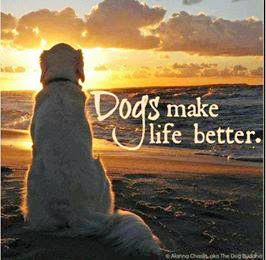 It works like the Underground Railroad, with the dogs ending up being safe, sound and happy. How great is that?!!? I'm an animal lover who wants to help by being part of a rescue dog transporter team. It's one small way I can help save dogs who would otherwise be put to death in the states of Kentucky and West Virginia. Each driver picks up anywhere from 1 to 4 dogs from a person who drove them to the pickup location. The network of individuals who perform this service are incredible people, as most animal lovers are. The funny part of all this is that I have cats, Mandi and Riley, and just added (4/14/12) a third kitty, SuzyQ. 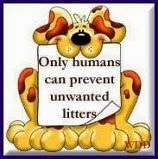 But I love dogs too and have had several. And I hope to have another one when I retire. But till then, Mandi, Riley and SuzyQ will have to do. And that's just fine with me.